Marchionne is pushing forward the most sweeping corporate reorganization in Fiat's 111-year history. 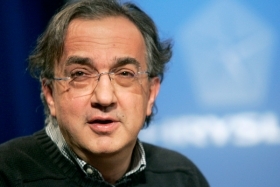 TURIN, Italy -- Sergio Marchionne said Fiat could increase its stake in Chrysler from the current 20 percent to 35 percent by the end of next year and that Chrysler plans to launch its public stock offering by the end of 2011. Earlier this week, he said the IPO would take place in 2011, but wasn't more specific. “I don't think it's the first part; I think it's a second-part-of-the-year event,” Marchionne, who is CEO of Fiat and Chrysler, said on Thursday when asked when in 2011 a Chrysler share sale would take place. Talking to reporters here on the sidelines of the Fiat shareholders' meeting that approved the spinoff of the Iveco heavy truck and Case New Holland farm and construction equipment units from Fiat Auto, Marchionne said Fiat could get an additional 5 percent of Chrysler by year end. “With the start of production of the Fiat 500 in December, we are fulfilling the first of our three obligations to grow our stake to 35 percent,” he said. Marchionne added that he is not particularly worried about when Fiat receives its three additional installments of Chrysler equaling 5 percent each. “What is important to me is to reach the goals we are set [on] reaching; share transferring is just a consequence of the fulfilling of our obligations with the U.S. and Canadian governments,” he said. The Iveco and Case New Holland separation allows Marchionne, 58, to focus on carmaking and gives Fiat an entity to facilitate future alliances. The spinoff, the most sweeping corporate reorganization in Fiat's 111-year history, will resolve an issue that's been a “thorn in the side” for Italy's largest carmaker, Marchionne told shareholders. Marchionne acknowledged Chrysler had been silent with its dealers in the past 16 months, “but when we had 16 products to show, we did it." He added that the 2012 Viper was the fruit of the “incredible commitment in doing things I found at every level of the Chrysler organization." Marchionne also said the Fiat 500 electric model, due in 2012, will be sold in Canada and Mexico as well as the United States. Mexico and Canada also will get Alfa Romeo, Fiat's sporty brand, which is re-entering the U.S. market in late 2012 through selected Chrysler dealers, he said. Asked about the status of negotiations with Volkswagen AG on the possible sale of Alfa Romeo to Europe's largest automaker, he reiterated selling the brand is not on his plans. “I did not knock the door for Alfa. Someone else did,” he said, adding that “what VW does is not our business."